Thailand and Thai culture are exotic. In spite of the effects of mass tourism and globalization, Thailand is unusual in that it preserves much of its unique traditional culture very largely intact. This compelling collection of articles aims to highlight facets of Thai life, aspects that in most cases are readily seen and yet are defining in their own way of the ‘Thainess’ that indelibly stamps the culture of a country and a people so fascinating and, ultimately, so endearing. The articles are grouped by themes covering The Buddhist World; The Supernatural World; The Ceremonial World; The Festive World; The Natural World; The Art World; The Sporting World and The Changing World. 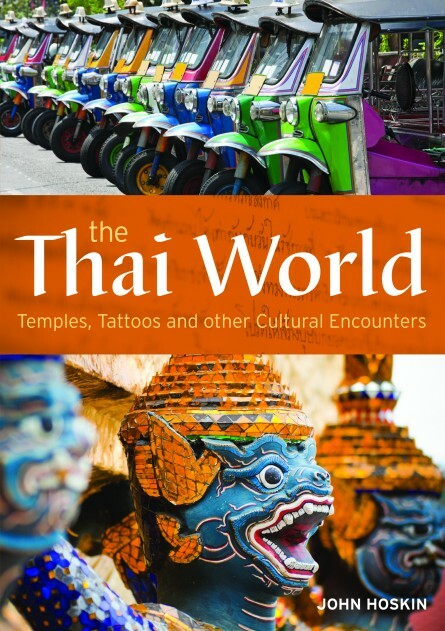 They reflect the author’s long fascination with the country – he has lived there since 1979 – for him it is the unexpected that underscores precisely what the city and Thai culture as a whole is all about – the ability to constantly surprise, to offer fresh encounters – as this fascinating book gradually reveals. John Hoskin is a British writer who has been based in Bangkok for the past 32 years. After completing a BA degree in History and a Masters in Cultural Studies at the University of Birmingham, England, he began his career in London. Subsequently, he lived and worked in Sydney, Amsterdam and Hong Kong before settling in Thailand. He is the author of more than 20 books on Thai and South-East Asian history, culture and travel, including Ten Contemporary Thai Artists, The Mekong: A River and Its People, Bangkok by Design, and Presenting Thailand. He also regularly contributes feature articles to various regional and international publications.